Yoho National Park, on the western slopes of the Canadian Rockies in British Columbia, is the quiet neighbor of more popular Jasper and Banff national parks (home of tourist hot spots Banff and Lake Louise) in Alberta. Founded in 1886, Yoho is also the 2nd-oldest national park in the Parks Canada system. Must-sees include Lake O’Hara, Emerald Lake, Wapta Falls, Takakkaw Falls, and the natural bridge and the Kicking Horse River that flows beneath it. While you can explore Yoho on your own, adventure is made easy with white-water rafting tours, stand-up paddleboard trips that call on Wapta Falls, and group excursions by minibus to Yoho’s waterfalls. Nature lovers and outdoors enthusiasts adore Yoho National Park, and active families can find hiking trails well suited to many levels of ability. The tiny village of Field, British Columbia, is the only settlement in the park. It has a general store, restaurants, accommodation, and small shops. Much of the park is backcountry, accessible only via winding mountain roads or on foot. Yoho National Park is on the eastern edge of British Columbia, 52 miles (84 kilometers) from Banff. The nearest airports are in Calgary and Vancouver; long-distance buses stop in nearby Golden. Visitors usually arrive by tour bus or by car via the Trans-Canada Highway (Highway 1). 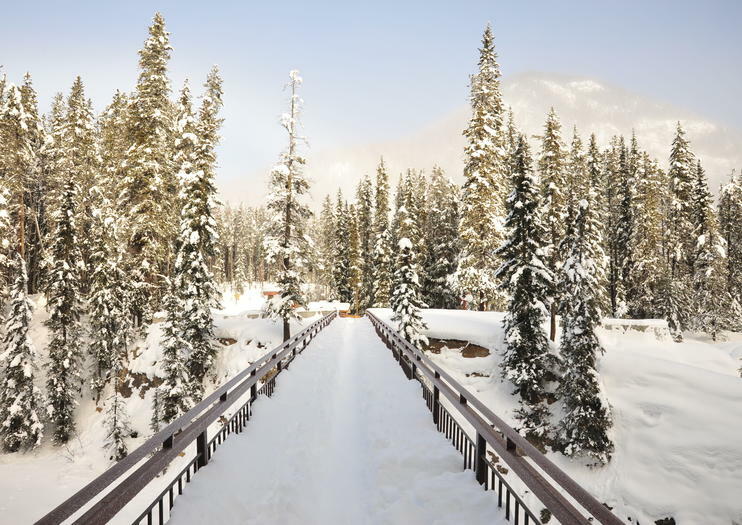 The park is open year-round, though snow limits accessibility for most of the year (generally October until June), and many visitor services are closed in the winter. In summer, weekends are busier with traffic than weekdays, but Yoho is rarely crowded. For true adventurers, a hike into the fossil beds of the Burgess Shale is an experience not to be missed. Guides from Parks Canada or the Burgess Shale Geoscience Foundation lead these strenuous, day-trip hikes (self-guided hikes are not permitted). Choose from a hike to the Walcott Quarry or Mount Stephen. Both require reservations and a high degree of preparedness.